Walking around the streets of Ebril, an Iraqi city with close to half a million inhabitants, strong cues of the birth of a new nation are clear to see. There is an imposing Parliament at the centre of the city, diplomatic missions of a number of foreign states, with many more lined up to open their consulates in the city. There are soldiers who sport a non-Iraqi national flag on their uniforms, a separate national anthem and news channels that are running in local languages - almost every sight is a telltale sign of the upcoming birth of an independent nation. The winds of change are here as the Kurdistan Regional Government (KRG), the autonomous Kurdish region in northern Iraq under Baghdad's writ, is beginning to take shape. In early February 2016, President Masoud Barzani called for a referendum on Kurdish independence. "The time has come and the conditions are now suitable for the people to make a decision through a referendum on their future," he had said. Barzani has now promised his people a referendum on independence in the aftermath of the war. The Kurdistan region gained autonomy within Iraq in 1991 after US intervention and was officially recognised by the Iraqi Government in 2005 with a 17% share of Iraq's national budget (proportional to the population of the region to the national population). Since then, talks of Kurdistan becoming an independent nation have only intensified after ISIS laid siege over huge parts of Iraq. The turmoil brewing in Iraq and Syria and the shifting borders may eventually come to fulfilment of a dream of Independent Kurdistan region that has remained shattered for a century, after the signing of Sykes-Picot agreement (by which most of the Arab land, after the fall of the Ottoman Empire, was to be divided between France and Britain). In fact, the war against ISIS has illustrated Kurdistan's de facto independence better than any referendum could. Cut off from Baghdad since it first began, the region functioned independently. Like the Tibetans and the Tuareg, Kurds too have been reduced to a status of 'landlocked tribes'. If one were to draw a map of Kurdistan, it would probably be a peanut shaped footprint with South East Turkey on the north, and Northern Iraq (the KRG region), swathes of Syria and Northwest Iran framing the rest of its borders. That's where the plausibility and difficulty of it becoming an independent nation kicks in: a region spreading over four independent nations would require multi-nation approach with a veto from the world's super powers to gain independence. But there are a few factors that work in its favour too: a diaspora of some 40 million spreading across these nations with distinct culture, language, a multi-party system with deep rooted democratic ideals and its own military, ready to provide a sense of stability in the troubled region. It will be important to watch how politics takes turns in this instable region in the near future, where same nations are fitted for and against each other in different situations. Turkey, which has taken a stand against Bashar al-Assad's regime in Syria and is a key supporter of rebel Syrian groups, has however been critical of coalition support for the Syrian Kurdish Popular Protection Units (YPG) - an affiliate of the banned Turkish Kurdistan Workers' Party (PKK). The PKK has for decades been on opposite side of Turkey and majority of Turkish Kurds who for past three decades had sided with Erdogan's party AKP are tilting towards the new outfit, the People's Democratic Party (HDP) that has emerged as the country's major opposition force. However, President Recep Tayyip Erdogan is trying to bridge the political and diplomatic isolation Kurds have faced in the country, though that is more of a well-placed politically correct move to assuage the growing domestic turmoil. The Syrian Kurdish faction is divided into three groups. The first has sought an arrangement with the Assad government in Damascus in exchange of promised concessions. The second group voices an autonomous region on similar lines to Iraqi KRG and the third group has sided with PKK of Turkey and aims to carve out a mini state of the Kurds. These developments have both concerned Iran as an extended autonomous Kurdish region would block the trade channel that Iran uses to send arms and amenities to Syria and Lebanon. In response PKK has activated the rebel Kurd faction of Iran PJAK. Fearing major backlash, Iran has taken measures to identify the Kurds in the country and address their issues and is also rendering tacit support to the Kurd faction of Iraq. The third major player in the region, Iran, the only Shia majority nation in Middle East, is probably the only backer of Asaad government, along with Russia, which wants to protect a key naval facility leased at the Syrian port of Tartous, which serves as Russia's sole Mediterranean base for its Black Sea fleet, and has forces at an air base in Latakia - Assad's Shia Alawite heartland. Russia has also been blocking resolutions critical of Asaad regime in the UN and continues supplying arms to the Syrian army. Both Iran and Russia had been critical of PKK's activities in Syrian Kurdistan. 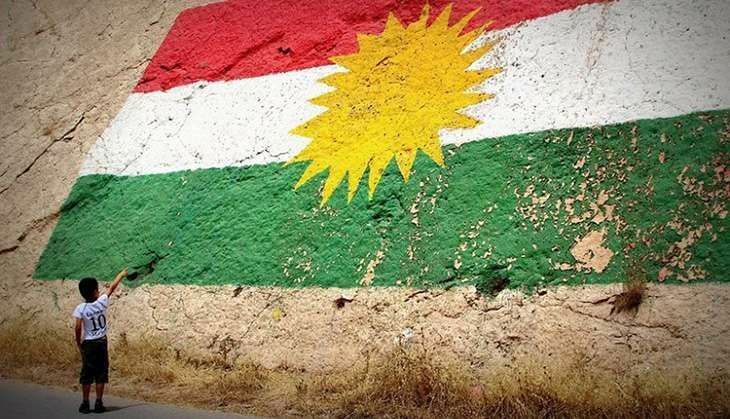 For the birth of independent Kurdistan, the omens have never been better. When ISIS raced across the Syrian desert to capture the second largest city of Iraq, Mosul, barely an hour-long drive from Ebril, it declared independence, effacing the century old Sykes-Picot agreement and thereby diluting the boundaries between Syria and Iraq. This presented a ripe opportunity for Kurdish Government and the Peshmerga to strengthen its borders and its claim on autonomous Kurdish region. Unaffected by the Shia-Sunni divide which plagued Iraq, Kurdistan has established itself as a more stable, prosperous and democratic region of Iraq. While conventional wisdom says that a non-Arab, non-Persian and non-Turk entity might be a source of further instability in the region, Kurdistan has played a constructive role and established diplomatic and trade relations with major Arab nations including Turkey and Iran, along with United States. Paradoxically Turkey, which for decades had been vociferously against the Kurdish identity, went the farthest to embrace it as a trade partner. Turkey's move of allowing the passage of two oil pipelines and one gas pipelines from Kurdish soil to its territories without taking Iraq into confidence, also paved way for Kurdistan's economic independence to metamorphose into political independence. This was further strengthened by Kurdish army take-over of the oil rich city of Kirkuk, a city long hailed as Kurdish Jerusalem, the spiritual and political focus of a new state. The capture of Kirkuk by the Kurds has changed many equations in the region. The Kurdish army, Peshmerga (Kurdish for 'ready to die'), though armed with age-old equipment, played a significant role in retreat of ISIS from Mosul. The collapse of large swathes of Iraqi army in Northern regions created a vacuum which the Kurdish filled, thereby gaining 40% more territory than their original. The Peshmerga are also well supported and supplied by US forces to keep the jihadis at bay. The Kurds, while backing the Iraqi forces, are also playing more of defensive role, trying to secure the borders from the rest of Iraq, including the ones expanded during the course of war. And they have had notable successes, the most glaring being the recapture of Kirkuk. At the same time, the Iraqi-led Kurdish faction is patching up its differences with the Syrian cousin faction called Rojava, in the Northeast Syria. Rojava is in sway with Turkey based Kurdistan's Workers Party (PKK). This reconciliation between the two factions, together with a ceasefire called between Turkey and PKK and improved relations with Turkey elsewise, has improved Kurdish fortunes elsewhere - especially in Kobane region on Syria's northern border with Turkey. This has also helped make Kurds emerge a stronger and a more united force. Though PKK has had major differences with its Iraqi cousin over form of governance (where former seeking full independence and the latter self-governance within Baghdad's writ), the war has brought them together rallying for the cause of Kurdistan. The Syrian faction has also set up wide ranging self-administration policies in the region, similar on the lines of KRG in Iraq. Turkey has changed its stance on Kurds; Erdogan's government recently abandoned the long held policies of suppression of Kurdish culture and signed a ceasefire with PKK, the Kurdish rebel party of Turkey. Iran is also strengthening its ties with KRG, who it sees as an important ally to keep off the ISIS from its borders and also to gain support of the Kurdish minority in its country. All this means that the Kurds, which held the status of the largest nation without a state for decades, could soon establish their first national homeland. Still, a climate of uncertainty prevails in the region and the creation of a new state in the region could invite more voices of independence and also prompt a complete fall of the Iraqi state into three factions - the Kurds, the Shias and the Sunnis, further intensifying sectarian conflicts. Kurdistan is still far from economic independence; being a land-locked region it is completely dependent on Iraq or Turkey for shipping of its oil. Any event of separate nationality will come with unwanted truce with Iraq; and Turkey with its long history of Kurd suppression may anytime turn its back. Since Kurdistan's economic backbone is oil, this could take a hitting on nation's prospects and add to it the volatile future of oil. Dipping oil prices with no external support from Baghdad may sound a death bell to Kurdistan liberation. Kurdistan's liberation will also depend on ISIS' next moves and how the war marked landscape of the two countries changes. ISIS movements are both a boon and bane to the creation of a new state because for safeguarding of present territories, KRG depends on Iraqi forces. If the war intensifies further, chances are high of breaking of Iraq into different independent states of different sects as sectarian violence can continue for years and Kurdistan has shown way that autonomy can work. No matter what political cards are played and to what extent redrawing of map is done, this would entail huge migrations and sectarian violence, but that might put a full stop to the ongoing violence. Iraq was always a group of ethnicities put together in a box, and the current violence has opened this closed box. The historical injustice was done in the Sykes-Picot Agreement in 1916, when nations were invented and borders drawn in a conference, without appreciating the ethnic complexity in the region. Sunni rulers were placed in Shia majority areas to counter the dominion of Shia clergy and ethnicities were put in the same box to keep the region volatile and arrest the ambitious of Turkey and Russia. And in all of these diplomatic soft plays, Kurdistan lost. The ongoing war has brought the same age back to us. Is the redrawing possible, only time can tell; but yes, the independence cries have been raised and they will make themselves heard.